Hello again, this is Tillian and this is another TOTS Predictions. It’s Serie A time. A lot of people are using Serie A teams and I understand why. A lot of good and META players in every line and players prices aren’t that inflated due to their “not-so-known” status. Of course, Cristiano Ronaldo transfer boosted popularity of Serie A, but league became more “expected” in terms of results. Juventus will probably be a champion of Serie A with 6 games to finish. Other teams are struggling a lot. Napoli lost a lot of points everywhere. They’ll still finish 2nd I think, but first season under Carlo Anchelotti wasn’t the best. Inter causing a lot of drama this season due to Icardi contract and their neighbors – Milan – playing a bit better due to some great transfers, but still losing points here and there. Atalanta one of the more exciting teams to watch this season. Their attacking force is one of the most goal-scoring partnerships of the season in Europe: Zapata, Ilicic and Gomez all scoring and assisting eachother. Lazio performing to their level and still has a chance to get UCL spot, but it’s gonna be hard for them. But their town-neighbors are worse. Roma’s season gone wrong and they sacked both coach (Di Francesco) and director of football (Monchi) after their exit of UCL and struggles in league. So, this is a quick rundown of top of the table done – let’s move onto predictions. We’ll start with goalkeepers and there are a lot of good choices. Each of: Handanovic, Szczesny and Donnarumma performed really well this season. Even though for Woijczeh it’s easier – due to strength of Juve defense – he still performed better than expected and replaced Buffon pretty well. Donnarumma performing once again great for Milan. Yeah, he had few mistakes that lead to crucial conceded goals (for example game vs Inter in the start of the season, or game vs Sampdoria), but still saving Milan a lot of times and his TOTS would be deserved. 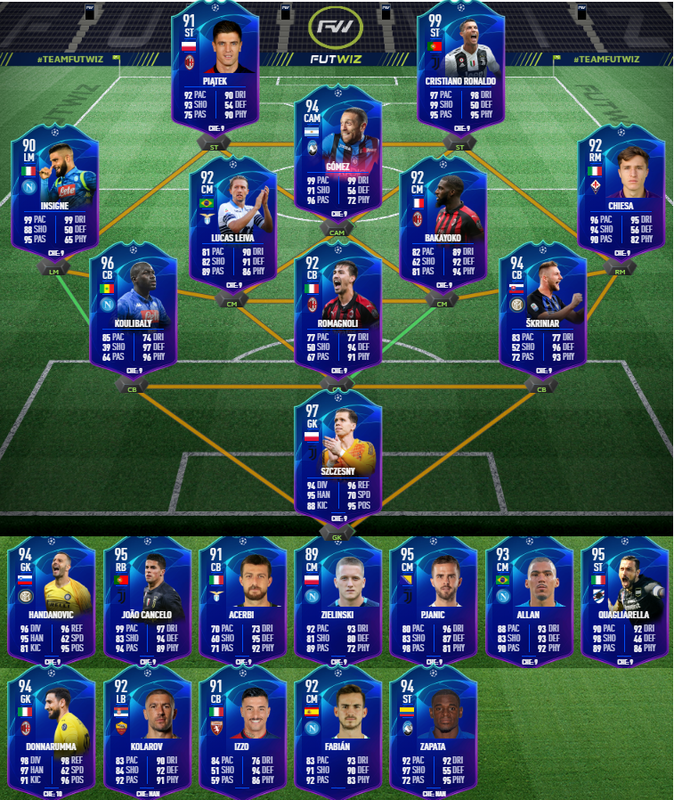 And the last pick, yeah, I went with 3 GKs in this TOTS predictions, due to all 3 performing well, is Samir Handanovic. Even though I don’t really like him much, because he sometimes conceding really strange goals, but he is consistent performer and saving Inter a lot. Alternative pick: Alessio Cragno from Cagliari. Statistically best goalkeeper of the season, but that because he’s playing with average defense. Wouldn’t be surprised if he’ll get included in TOTS in the end. Let’s move to defenders. This is gonna be hard. I see 3 main candidates for center-backs. Milan Skriniar in my opinion is the best defender in Serie A. Playing really consistent and well for Inter and overall one of the more hyped defenders in the world. Also, in terms of FUT – he’ll be really good. Even his SBC card is one of the better defenders in game. Alessio Romagnoli is the captain of Milan and he improved this season a lot. He also scored 2 goals, but more importantly he controls defense of Milan and improvements under Gattuso management are visible. And, of course, Kalidou Kouilibaly. Leader of Napoli defense and leader of Napoli. Again another exceptional season for Senegalese. I don’t know what else to explain because I think all those 3 defenders are locks and shouldn’t be debatable. Another lock is Joao Cancelo. What a transfer for Juve. Joao played everywhere this season for Juve: RB, LB, RM and performed well everywhere. Inter probably biting their nails when they couldn’t sign him permanently. Arguably more important transfer for Juve than Ronaldo. Yeah, at least, in terms of Serie A. 2 Sub Center Backs are: Armando Izzo from Torino and Francesco Acerbi from Lazio. Acerbi very consistent performer in Lazio. Best defender of Lazio and also playing for Italy national team. Scored 3 goals this season and got one of the higher average ratings in the league. Armando Izzo has been a surprise to me, one of those goal scoring CBs – he scored 4 goals and all of them were winning goals. He also got a lot of MOTMs. I think he might miss out of TOTS, but it’d be real shame. He'd be a decent card in FUT. Alternative choice for CBs: German Pezzella from Fiorentina. Fio’s defense has been not really good this season, but Pezzella was a consistent performer and might get TOTS. And now is the hardest defender to choose: Left Back. There are 4 defenders and I expect 2 of them get in TOTS. I’d place Alexander Kolarov in main team, just because he’s the best Roma player this year. Probably the only one who was good in Roma, apart from Kolarov – Zaniolo. Kolarov scored 7 goals and got 2 assists this year and IMO he should be a lock. 3 other choices: Alex Sandro, Cristiano Biraghi and Domenico Criscito. Biraghi another defender from Fiorentina. He was great this year and earned call-up for Italy national team. Scored 1 goal and got 4 assists. Consistent performer, but I doubt that he’ll be included. Alex Sandro, on other hand, hyped defender. He’s always on headlines of newspapers and his TOTS would be deserved. But… he’s playing for Juve. Juventus defense is exceptionally good, because they are controlling more than 60% of game time. In terms of FUT he’d be exceptional choice. One of the best LBs in history, if he’ll get TOTS. And the last choice: Domenico Criscito. He returned to Genoa after playing Zenit for a long time. Captain of Genoa performs great and playing at LB and sometimes at CB. I’d love to see him get TOTS, because he’d be a fun card. Let’s move to midfielders, shall we? Let’s explain easiest choices: LM and RM, and after that we’ll move to the hardest position to choose: CDM\CM. Choice for LM is Lorenzo Insigne. 9 goals and 6 assists. He carried Napoli a lot of times. Yes, he quite often plays as CF\ST, but I needed LM choice for predictions and he played quite few games at LM too. On the right side placed Federico Chiesa. Youngster performing amazingly for Fio and got himself 6 goals and 3 assists. Again, not a lot of choice for this position too. Alternative choices for LM: Gervinho and Rodrigo De Paul. De Paul can get into TOTS at both LM and CM positions. Rodrigo De Paul playing everywhere in Udinese. He’s a leader of Udinese. He scored 9 goals and got 4 assists. Gervinho came back to Serie A and playing surprisingly well for Parma. He scored 10 goals, got no assists. Not so consistent performer, but wouldn’t be surprised to see his TOTS. For Right mid spot: Suso. He started amazingly well this season, but then slowed down after Milan did few signings and they moved to different style of play. He got himself 5 goals and recorded 8 assists. But, as I already said, after New Year he slowed down. Now, Center Midfielders. For defensive choices: Allan from Napoli, Lucas Leiva from Lazio and Bakayoko from Milan. Bakayoko recovering his career after Chelsea transfer. In Milan he’s playing similar role to Monaco and it suits him amazingly well. Gattuso knows how to get the best out of him and Bakayoko been amazing for Milan. Lucas Leiva is a captain of Lazio. Another consistent season for Lucas. As a center midfielder – he got one of the higher ratings in Serie A. He got 1 assist and I wouldn’t be surprised to see him excluded from TOTS, but it’ll be a real shame. Allan. Allan never changes. Under different manager he still played amazing this season. He’ll get a TOTS and a lot of people will be happy with that, because many people rate him in game. Got only 3 assists this season, but that’s because he’s playing more defensive role. There are also 2 other Center Midfielders from Napoli who deserves to be in TOTS. Fabian Ruiz and Piotr Zielinski. Both of them played amazing. Fabian Ruiz scored 3 goals and got 2 assists, he hasn’t played a lot of games, but came on as a sub a lot of times. Praised by a lot of experts and rated as one of the better signings of a season. Piotr Zielinski scored 5 goals and got 1 assists. Played everywhere on a pitch. He played literally everywhere. And his TOTS would be deserved. Miralem Pjanic leader of Juve midfield. He controls games, he passes exceptionally well (pass accuracy 92%) and Juve without him playing much worse. He scored 2 goals ( I think both of them were free-kicks) and assisted 4 times. As an alternative choice for one for midfielders: Marcelo Brozovic. One of the better Inter players this season. He plays usually as CDM and got 2 goals and 1 assist to his name. A lot of people saying that he’ll get TOTS and I’d be happy with it too. Alejandro Gomez. I can place him everywhere: LW, LF, CAM, CF or ST. I decided to place him at CAM, because he usually plays there. He got 5 goals and got 7 assists from CAM position. His TOTS will be really fun to use too. Let’s continue Atalanta theme and include Duvan Zapata. Surprise of the season for sure. Already scored 20 goals and got 5 assists. He started season slowly but after December hasn’t stopped. What a player. Perfectly suits Atalanta play-style too. Cristiano Ronaldo. Of course, CR7. Scored 19 goals and hasn’t played 100% of games. Proved himself in Serie A and of course he’ll get TOTS. Another lock is Krzysztof Piatek. Oh, Polish names, how I love to write them out. 13 goals in Genoa and 8 goals in Milan. Another surprise of the season. Performed in both teams. Sadly in FUT his card isn’t so desirable due to his base card being so bad. Fabio Quagliarella. Like a good wine – with age becomes better and better. 21 goals and 7 assists, while him being 36 years old is really impressive. I mean: REALLY Impressive. His TOTS card will be insane and I really can’t wait to try it out. Arkadiusz Milik. Another Polish name. 16 goals and 2 assists. He became free-kick specialist this season. Finally playing without injuries and he’s showing his potential finally. Ciro Immobile again playing well. Not that well like previous few seasons, but still scored 14 goals and got 4 assists. Struggled a bit this year, but still managed to score a lot of important goals. Josip Ilicic is a third piece of Atalanta attack. 11 goals and 7 assists. Playing as RF, ST, CF and sub. If he’ll finish his season like he’s been playing after December – he’ll get TOTS. Maybe instead of defender, so we’ll have more attackers?